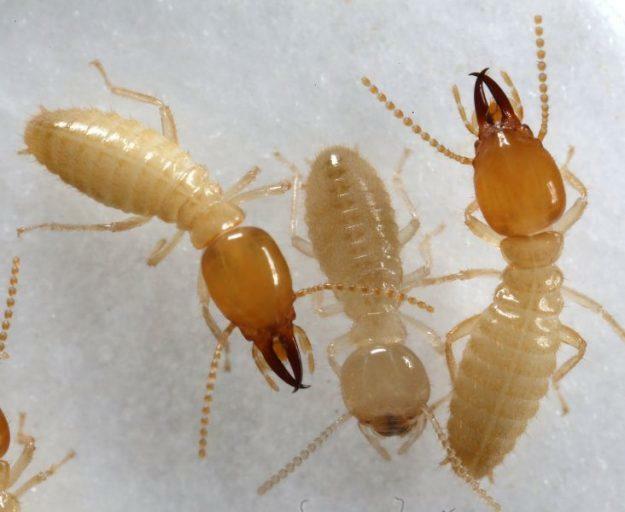 Formosan Termites are the most destructive termite pest in the U.S., and arguably the world. The average sized Formosan termite colony can consume one foot of 2X4 wood in 25 days, and are difficult to control once they infest a structure. Colonies are established quickly, are much larger, more aggressive and damage structures faster than other subterranean termites. 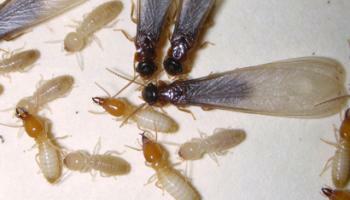 Mature Formosan termite colonies can contain one to ten million individuals. Color: winged reproductives are yellowish-brown, solder bodies are cream colored with orange-brown oval-shaped heads, workers are cream colored. Region: Alabama, Florida, Georgia, Louisiana, Texas North Carolina, South Carolina, Virginia, Tennessee, and Hawaii, Most often along costal areas. Habits: Formosan Termites create nests called “carton nests”. These nests are made of saliva, chewed wood and excrement. Most of these nests are created within structures that the termites have hollowed out or used as a food source. Large swarms take place in early in the evening from spring through the summer months. Habitat: Formosan termites live underground and infest trees, shrubs, utility poles, timber, railroad ties, boats, homes, and building. Threats: Formosan termites are a very serious threat to structures, damaging properties quickly, thus should not be ignored. Prevention is always the best option when dealing with the destructive pests, waiting to treat until they infest is a costly mistake. Repairing the damage caused by termites will often costs more than the protective service.